The early history of Hawaii states that there were two influxes of people from Tahiti. The second voyages of exploration and settlement were led by chiefs who became distinguished ancestors of the chiefly families of Hawaii. In all these traditions, recognition is given to the fact that there were people here before them, descendants of the people who came with Hawai'i-loa. They were referred to as the Menehune people (ka poe Nenehune). Myth states that they were the descendants of Menehune, the son of Lua-nu'u, who appears in the chiefly genealogies of other areas as Ruanuku. The Menehune people were probably well distributed over all the Hawaiian islands, but myths and traditions concerning them cling more thickly to the island of Kaua'i. It is probable that the later invaders pushed them gradually out of other islands so that they congregated in Kaua'i, the last of the large islands, at the northwest end of the chain. From there they apparently withdrew to the barren and rocky islets of Nihoa and Necker, as evidenced by numerous terraces, stone implements, and stone images. Waimea Canyon on the island of Kaua'i is now deserted but shows evidence of very early habitation. Some traditions say that the thick forested canyons and valleys were home to the Menehune, come to be regarded as a physically short and mischievous people - much like Ireland's beloved leprechauns - that have been a fanciful part of Kauai's folklore. Their presence exists through hand-built walls and petroglyphs found carved in the rocks. In reality, they were neither gnomes or fairies, an erroneous description given to them by later story tellers - indeed, it seems to be a Polynesian characteristic to laud one's own family ancestors and to belittle those who preceded them in exploration and settlement. The Menehune were real, live people of Polynesian stock, and they are entitled to the honour and glory of being the first to cross the ocean wastes to Hawaii. While archaeologists have never found the remains of a distinctively small race of ancient people on Kaua'i, many think that the Menehune legend may well have a basis in fact. Some scholars now believe that the early Tahitians may have given the name "Menehune" to the Marquesan people who had reached the islands before them. Perhaps the powerful Tahitians forced their predecessors into servitude, driving them back into the canyons and valleys. The word "Menehune" can be translated as "slave" in the Tahitian language. Kaua'i's mythical Menehune were a very clever and industrious tribe. They had a reputation as master builders, but for some reason worked only at night under the glow of the moon. If they could not finish a given task in a single night, they abandoned it forever. Fortunately, this occurred only rarely. During one of their productive nights, the Menehune reputedly built the island's largest aquaculture reservoir, the Alekoko Fishpond located near Nawiliwili Harbour outside Lihue. 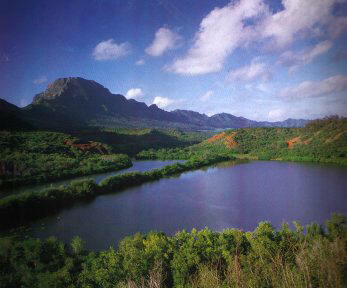 The fishpond was built for a Kaua'i prince and princess. This mullet-raising pond was created by constructing a 900 foot dam to cut off an elbow bend in the wide Huleia River. Holes in the dam allow young fish to enter the pond from the river but are too small to allow the grown fish to escape. A favorite engineering method was to pass rocks by hand along a double row of men in long lines from the site of their quarry. It took exact planning and well-organized teamwork. Before building the Alekoko Fishpond, the Menehune warned their royal patrons not to watch the construction that night. Their curiosity got the better of them, though, and they immediately turned into rock. The two stone pillars are still visible on a nearby hillside. The little people also get credit for building a number of heiau (the major gods that came from Tahiti were worshipped in walled enclosures of stone that were turmed heiau instead of marae) along the Wailua River and the Menehune ditch in Waimea. Although the ditch appears quite ordinary on first sight, inspection of the waterway reveals a unique kind of fitted and faced stonework that has been found nowhere else in Hawaii. Only a tiny portion of the ditch has been preserved but it once stretched for miles, starting from a dam upstream of Waimea River and running down the cliff to the farms below. The ditch was led past the perpendicular cliff by building up a wall and waterway with smoothly cut stone blocks to form a structure which is unique in Polynesia. Legend relates that the ditch was built by the Menehune at the request of Ola, a king who wanted to irrigate his taro patches. For their effort on his behalf, Ola gave them a single fresh-water shrimp. A neighbouring hill was named Shrimp Hill to celebrate the occasion and there it stands as a memorial to the parsimony of employers in those days. The one shrimp was probably introduced into the tale to stress the magic power of the Menehune who could feed the multitude on one small crustacean. Legend states that the only foods available in Hawaii on the arrival of the Menehune were the fruit of the pandanus, the pith of the fern tree, the root of the cordyline and the berries of the ohelo and akala. In Kaua'i the stronghold of the Menehune, there are two forms of stone pounders which are not found in any of the other islands of the group. They are termed "ring pounders" and "stirrup pounders" because of their shape, and they have comparatively narrow, elliptical pounding surfaces which form a marked contrast to the large, convex, rounded surfaces of the pounders used in the other islands to pound the taro tuber into the poi paste that formed the staple food of the later inhabitants. Old stories say that there were once over half-a-million Menehune living on Kaua'i. Gradually, they went into hiding and disappeared. A census taken in the early 1800s discovered that 65 people living in the town of Wainiha on the northern coast of Kaua'i put down "Menehune" as their nationality. This census is the last known official report of their existence.